Hubby & I have just returned from a wonderful few days in York to celebrate our 1st Wedding Anniversary. 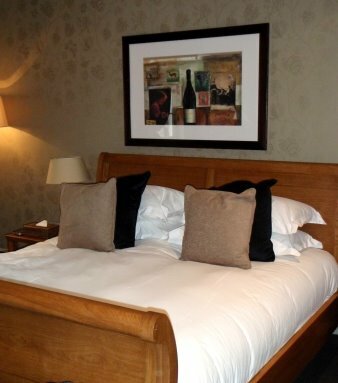 We stayed in the plush Hotel du Vin just a short walk from the city centre. Usually Hubby and I are the self-catering kind of people, but this time decided to treat our self. We would certainly stay in a Hotel du Vin again as not only were the staff lovely, the bed was huge and comfy, the bath big enough to wallow in and the shower…well enormous! For the first night, Tuesday, we booked The Tasting Rooms. I had been recommended this place by lots of people and we were both looking forward to it. So it was a bit of a shock when we turned up to find the restaurant closed, void of furniture and a bailiff notice plastered on the door. That night we ended up eating in the Bistro at the hotel. Thankfully Hotel du Vin is renowned for good food and wine and they certainly didn’t disappoint. We both started with a beautiful pea and ham soup, I then followed it with supreme of chicken, baby spring vegetables and red wine jus whereas Hubby ate Pork cutlet, fondant potato, swede and carrot purée with a calvados sauce. All washed down with a french white wine (sorry have totally forgotten any more information about it!) that was recommended by the sommelier. Wednesday in between visiting the minster and the museum we decided to treat ourselves to Afternoon Tea at Little Bettys on Stonegate. 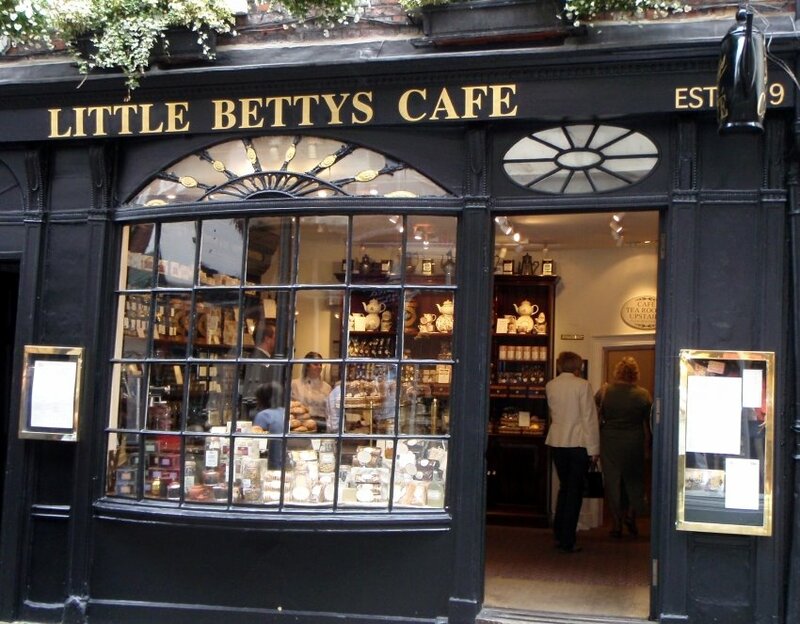 Little Bettys belongs to the same Bettys chain, but as it is hidden down a little street a lot of people don’t realise it is there and the queues are far shorter than the bigger Bettys just around the corner. Nothing prepared us for the glories that the Waitress presented with. A huge pot of tea, ham and chicken finger sandwiches, a giant scone with clotted cream and jam, lemon madeleine, dark chocolate filled profiterole and mini summer fruit tart. It was if I had died and gone to heaven! 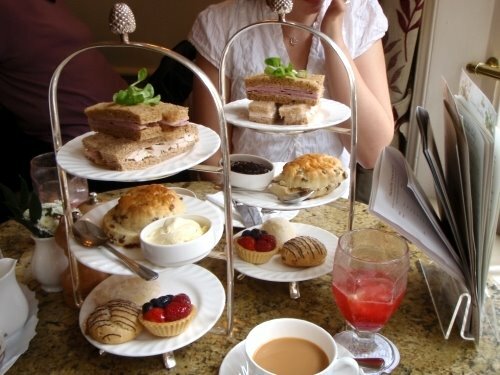 It was all delicious and next time we’re in York we’ll be heading straight for Little Bettys for Afternoon Tea. Wednesday we had booked a table at The Blue Bicycle, thankfully this restaurant turned out to be open! Given it was midweek the restaurant quickly filled up. There was a really nice atmosphere. While we waited we were served bread baked in mini terracotta pots and a whole roast garlic to smother over the freshly baked bread. For starters I had a very enjoyable Tempura mixed Vegetables (including asparagus and sweet potato) with Wasabi and a Soy & Sesame dipping sauce. Hubby ate home-cured Beef Fillet with Straw Potatoes & Horseradish dressing, he commented on how delicious the home-cured beef fillet was. It was cut very thin and had the texture of Parma ham. For mains Hubby had Grain-fed Chicken Breast stuffed with Oyster Mushrooms & wrapped in Parma Ham, with Crème Fraîche Mash & a ratatouille of Vegetables and I had Fillet of Yorkshire Beef with Fondant Potato, Beetroot Purée, Red Wine Jus & a Horseradish Crisp. My steak was cooked perfectly. No pudding as we were still full of Afternoon Tea! On Thursday we spent the morning touring the foodie haunts of York. A little gem we discovered was The Hairy Fig. A fab little deli down Fossgate. The little shop was packed to the rafters with amazing food. We were drawn to the cheese counter where we ended up buying some peccorino, 2 year matured gouda and intriguing Katys White Lavender, a white cheese made from sheep’s milk and rolled in lavender. Another great find of ours was Rafi’s Spice Box, where I was able to stock up on great Asian produce, including some Bombay mix that is very different and far better than any you can buy in the supermarket. It was so good it has already all been eaten. I love York and is the perfect place for a romantic city break. Happy first anniversary. 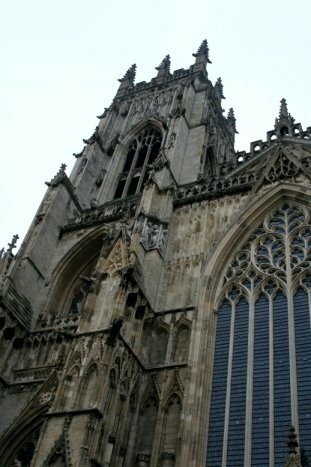 :) I also love York. It is just so pretty isn’t it? You seem to have had a wonderful time. I am very intrigued by the cheese you bought. I do like the Hotel Du Vin chain of hotels (we stayed in the Cheltenham one a couple of weeks ago, and in the last year have also been to the Bristol and Henley on Thames hotels). They’re not massively foodie but they have great wine lists, and very decent sunday night room/dinner deals. And those showers are something else!!! Congratulations on your first anniversary! I stayed in the Winchester Hotel du Vin once, our room looked quite similar to that. I’ve never been to York but it sounds worth a visit.